This past weekend, I presented at Maker Faire Milwaukee, showing off an electric lawn mower, an electric mini-bike, and Solar Death Ray. But probably the best part was helping hundreds of kids have fun LITERALLY coloring on the floor! Besides my 300MPG.org booth, I also volunteered to provide paper and crayons for an interactive exhibit entitled THE WORLDS LARGEST DOODLE. I rolled out 400 square feet of paper. This was “Seamless Paper” which is used as photographic backdrops. I ended up purchasing a large lot of it at an auction some time ago. I’ve used some of it for video backdrops, but many of the rolls of paper are short lengths or slightly odd colors. Some of the other paper was already covered in footprints on one side. Long story short, this paper is recycled/reused and wasn’t going to get used for it’s original intended purpose anyways. The paper is 9 feet wide. So, I made sort of a patchwork of paper to fit the 20′ x 20′ exhibit space. Next, I put out over 800 crayons. There were no directions for the kids, other than “Please Draw Something” and “Have Fun”. I didn’t put out any signs saying “Make sure to share” or even “Don’t write any naughty words!” Nope. No direction like that*. I figured it would be interesting to see what happened. What would they draw? Would kids write dirty words everywhere? Would there be political commentary? I looked forward to finding out. I also set up a time-lapse camera to see what would happen. Unfortunately, the camera didn’t work for the morning (a bad SD Card!) so I only got time lapse of Saturday afternoon. The paper looked nice and full far before the end of the day. People crammed doodles in all available space. There were quite a few scribbles, but I think that’s because there was a rather large amount of very young children. Parents appreciated just being able to set down their toddlers to let them play freely for a while. The First Robotics students also used the space as a way to promote their own teams by drawing up their logos. Overall, there were robots, unicorns, video game characters, and other recognizable characters from pop culture, along with simple shapes and objects like an eye or a fish. 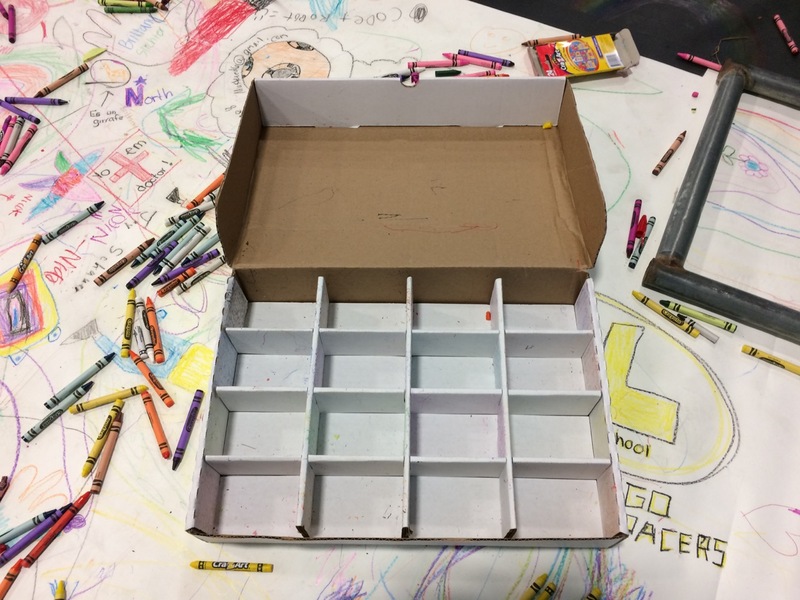 Unfortunately, at the end of day one, not ONE SINGLE CRAYON made it back into a box! Perhaps I SHOULD have given a little more direction… After about an hour of picking up crayons and sweeping, I was able to roll out fresh paper over the top of the first doodle, in preparation for Sunday. On Day Two, I had the time lapse camera running the whole time. The second day’s doodle was a little different. I noticed a few people were trying to promote themselves on social media by writing down hash-tags and snapchat handles. There was also a few more Doctor Who references (A Dalek army was right on the other side from the Doodle!) and there were some very nice doodles done by talented adults. I think I saw more adults doodling on the second day than on the first. Nowhere did the exhibit specifically say that adults COULD or COULDN’T participate. However, we tend to think of coloring with crayons as a children’s activity. Part of why I titled this project as a “Doodle” was to imply that neither what was drawn or the artist’s skill level was important; just start drawing! My projects tend to be about recycling. I’ve been doing quite a bit with electric vehicles and renewable energy lately. But at the center of everything I’m doing, it’s really about education and ENCOURAGEMENT. Don’t think you can build an electric car? I didn’t think I could either. Don’t think you can draw? No problem. Grab a crayon, nobody will know whose doodle is whose anyways. For a lot of things in life, we really don’t know what the end result is, but if you just get started… whether that’s picking up a wrench or a crayon, the end result can be amazing! *PS. 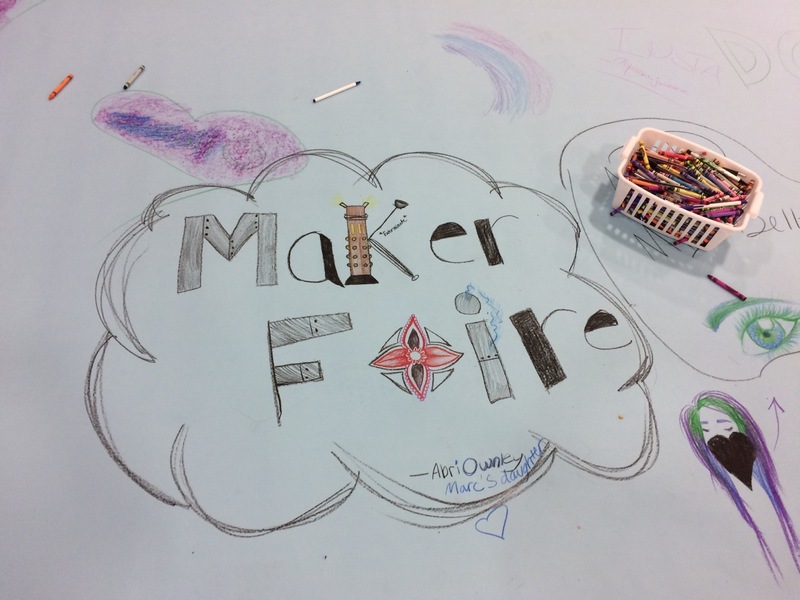 A big “Thank You” to all of the organizers and volunteers that help make Maker Faire Milwaukee happen!